In Wonderland anything is possible, and Alice must learn to interpret the riddles of the Caterpillar. With mushroom in hand, Alice tries a bit of each side, hoping to determine what they do. The next thing she knows, her head is in the trees, and her neck is so long she can't see her body! It is the moment among the tallest branches of the trees that Greg Hildebrandt has brilliantly captured. Alice has encountered the distressed Pigeon who fears she is a serpent! Though it attacks her at first, Alice is able to convince the Pigeon that she is not a threat. This scene is a gorgeous interpretation of Lewis Carroll's words, a vision that is born of Greg's wild imagination. 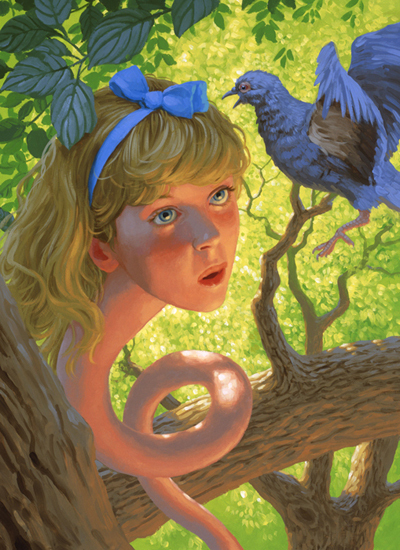 In 1990, Greg Hildebrandt took on one of the greatest challenges of his career when he decided to do his own illustrated edition of Alice in Wonderland. His love of the Disney movie and many of the illustrated books that had already been published made this a daunting task for him. Why? Because Greg wanted his Alice to look completely different from everything that had been done in the past. Greg struggled and nearly drove himself as mad as the Mad Hatter, but ultimately, his illustrated storybook was a huge success! Greg put his heart and soul into the Alice in Wonderland paintings, and says that the moment he truly embraced this project was when he, too, fell down the rabbit hole.